This is the board that will save your day when the waves are not so inviting. Its all about having fun in the water and this board does just that. The beauty about riding this board is the fact that you can experiment drawing different lines and feel the retro feeling of riding a twin fin. 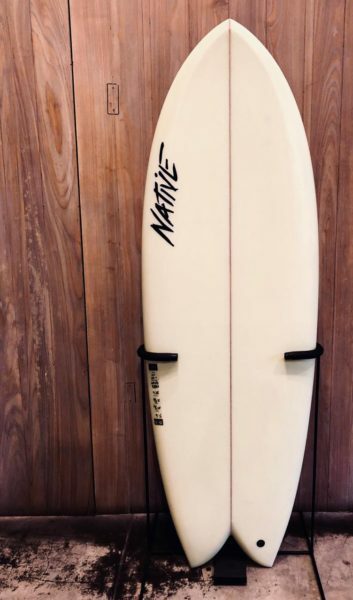 Perfect for the beachies and point breaks, this board flies down the line and with the side cuts on the tail, it helps you to do drawn out turns with ease. Plenty of volume, making it a wave catching sled. Suitable for all level surfers and definitely a must in your quiver. Nb. This model and a whole range of Native surfboards made from the best materials are now available at the Boardriders mega surf shop at Echo Beach / Canggu. Looking for new fins, leg ropes, reef boots etc etc, everything you would expect to find in a surf shop they have it !